In a week and a half both of my kids will be in school. My youngest is super excited about starting kindergarten and has been talking about it non-stop for pretty much the last two months. I'm excited, but also nervous. I have stayed home with my kids for 8 years and for the first two years after graduate school I looked for work and found nothing. So basically for the last 10 years I have stayed at home. I'm more than a little nervous about both of my kids being in school. Originally I had planned on going back to work when my youngest started kindergarten. However, my area has absolutely no jobs besides fast food and Wal-mart, and when I factor in the additional amount my student loans would go up and child care I probably would probably only break even. So for now I will be staying at home. It will be a time of transition for both my youngest and I and I'm hoping that the next couple of weeks bring lots of positive changes for my whole family. My family loves biscuits. They are one of their favorite breakfast foods and my youngest will eat two at a time if I let him. I try to add whole wheat flour into my family's diet whenever I can and this morning I made Whole Wheat Beer Biscuits. Adapted from The Sunset Cookbook. 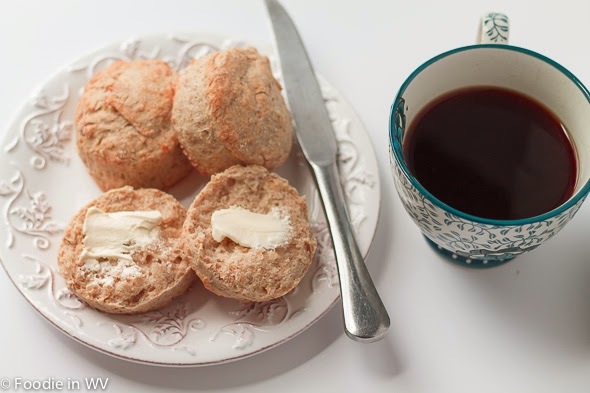 An easy biscuit recipe using beer and whole wheat flour. With your fingers or a pastry blender cut in the butter. Beat egg and then add to flour mixture. Add beer and mix just until dough comes together. Pat dough into a 1-inch thickness. With a 2-inch biscuit cutter cut out biscuits. Place on a greased or parchment papered baking sheet. Bake in a pre-heated 425 degree oven for 18-20 minutes. If your family isn't a fan of whole wheat flour this recipe would also work with white whole wheat flour. It's an easier transition to whole wheat for kids and has a rise similar to regular all-purpose flour. Make sure to not overwork your dough. The difference between great biscuits and mediocre is all in the amount of kneading. Biscuit dough needs a light touch. Never use a rolling pin, hand pat the dough out, and only mix the ingredients until they just come together. Anything more and your biscuits will be tough and won't rise. 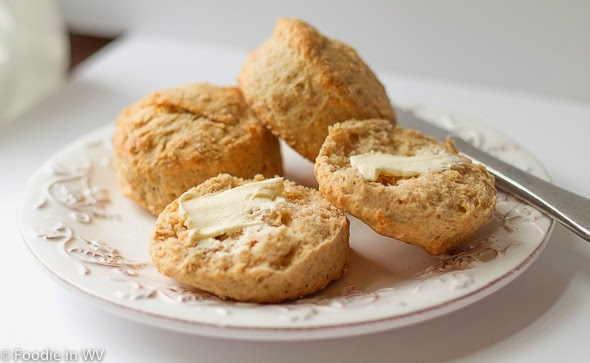 I have also tried this recipe with only 1/2 cup of butter and had similar results. I try to cut down the amount of butter my family consumes when possible and while the biscuits weren't as rich, my husband and kids didn't notice the reduction in butter once the biscuits had jam and/or butter on them. That's it! They have a beautiful rise in the oven and are great either with butter or jam. Any type of beer would work, I used a wheat beer that I already had in the fridge. Have a great week everyone. I think are really beautiful! I love they are with whole wheat flour! Thanks :) I like that they have whole wheat flour also, I try to use it whenever I can! They look yummy. I think I will try to make this this coming week. Pinning the recipe. Thanks for the pin :) Tell me how they turn out! These beer biscuits have turned out so beautiful! My youngest is going into 2nd grade, so this will be my 3rd year of not having any kids home with me during the day. I love it. I'm hoping that I love it too :) It's just going to take some getting used to! It has been a while since my last visit but for some reason my mind was on you this morning. It can be scary when your youngest leave for school. I remember feeling that way when my now 9 year old started. Now I have another to anticipate. We also start school in 2 weeks so I definitely know where you're coming from. As for jobs, I'll be jobless soon and really thinking being a stay-at-home mom for a minute may not be a bad idea at all. As for those beer biscuits, the recipe looks delicious but my kids aren't fans of whole wheat. I'll probably have to substitute for white flour and hope it tastes the same. Here's hoping you're having a Terrific Thursday! It is a scary time, but I hope I'm ready :) I will more than likely stay being a stay at home mom for a while. Unless a really great opportunity comes my way it makes better financial and over all sense for me to stay at home. Have you tried white whole wheat? My kids where reluctant when I first started using whole wheat flour, but they love white whole wheat. I have actually never tried white whole wheat before. I'm sure that might be a better alternative for those who are addicted to white bread. I'll have to give that a try. Thanks for the suggestion. These look good and I don't even like biscuits. I know if I make these, they will disappear in a few minutes out of the oven. Your little one in Kindergarten is a big transition for all of you. Maybe you can do some freelance work or find something else you like to do?